The location was named Camp McDowell, and later renamed Fort McDowell in 1867 when established by the California Volunteers on the Verde River in 1865. It was named for Major General Irvin McDowell. The fort was located within Indian country and built to be near the area's travel routes in an effort to protect them from the Apache who lived in the Gila River and Salt River valleys. 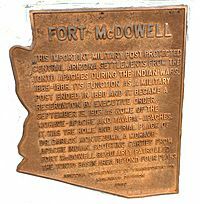 The post office opened as McDowell in 1869 and changed to Fort McDowell in 1923. Some Native Americans of the region chose to seek refuge in the surrounding mountains rather than conform to the constraints of reservation life. These displaced Indians often traveled in small groups to avoid detection Their presence however caused fear and unrest for nervous settlers, and thus a military outpost (Camp Verde) was deemed necessary to protect trade routes within the region. In addition to the Salt and Verde rivers, Fort McDowell was in close proximity to a number of trails important to the Apache of central Arizona, and the installation conducted numerous military exercises against the Tonto Apache and others. Originally named Camp Verde, the fort was thought to be able to withstand an onslaught from these so-called renegades' but in fact, the structures failed to survive the heavy summer monsoon rains, washing away not long after being built. The Stoneman Military Trail served as a supply trail and connected Ft. McDowell to Ft. Whipple in Prescott, Arizona, during the years 1870–1890. According to the Köppen Climate Classification system, Fort McDowell has a semi-arid climate, abbreviated "BSk" on climate maps. The remaining ruins of the Fort McDowell officers quarters located in Ba Hon Nah Road. Fort McDowell ruins located in Fort Loop Road. Fort McDowell Church located in Fort Loop Road. The ruins of one of the buildings which belonged to the original Fort McDowell. Abandoned house in the land of the Fort McDowell Yavapai Nation. Deer Head on top of the Yavapai resting area. 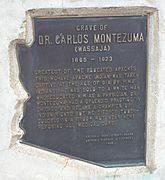 The grave of Carlos Montezuma or Wassaja in "Ba Dah Mod Jo" Cemetery. Montezuma was a Yavapai-Apache Native American, activist and a founding member of the Society of American Indians. His birth name Wassaja, means "Signaling" or "Beckoning" in his native tongue. He was the first Native American male to receive a medical degree. 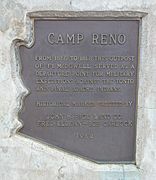 Marker which indicates where the historic Camp Reno was located. Camp Reno ruins. Camp Reno was a look out post for Fort McDowell. Fort McDowell, Arizona Facts for Kids. Kiddle Encyclopedia.